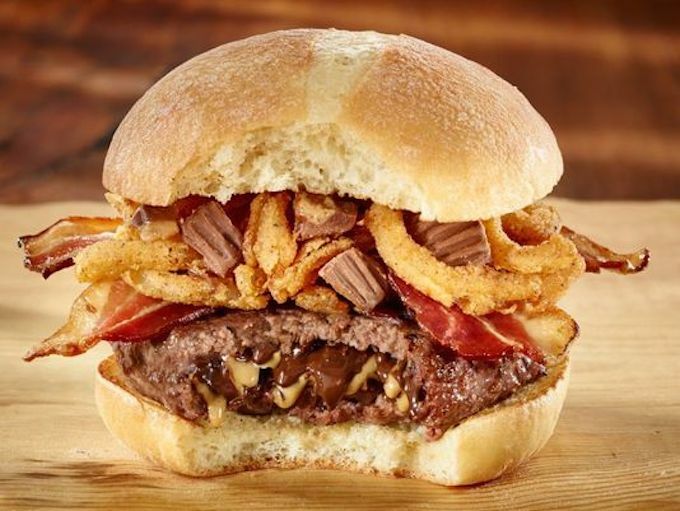 Sometimes, when you make a big move, you don’t have to do anything, just sit back and watch the jaws drop and arteries clog: a Canadian restaurant chain has lit up the internet by debuting a burger stuffed — and topped — with Reese’s peanut butter cups. Americans in search of something new to test the limits of calorie-laden Frankenfood creations can travel north to Canada, where Ontario-based burger chain The Works is peddling the Reese’s PBC: it’s got peanut butter chocolate candy inside the beef patty, as well as more crushed on top. All that heart-stopping glory goes for $15.98 Canadian. Is this a trick or a treat? It depends on how you look at it, and how strong your stomach is feeling on any given day.